Now that you have mastered the basics of the game of craps, you must be curious about strategies that could improve your chances of winning. Understandably enough, before you start playing for real money, you need to know what you are dealing with. Fortunately, I will dedicate the following lines to various craps strategies. Some of the strategies I am about to list are helpful, while others would just waste your time. By the end of our journey, you will know which ones to incorporate in your game, and which ones to avoid. 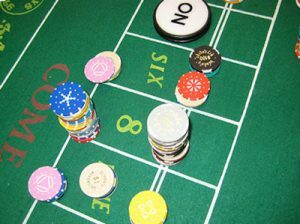 By using the strategies that have a mathematical and logical foundation, you will be able to win at craps more often. You will select a strategy depending on your gambling form of choice. Whether you are inclined to stand at a craps table at one of the brick-and-mortar casinos in Las Vegas or enter an online casino, you will find a suitable approach to this casino game. You cannot predict a roll of the dice, but you can calculate the odds based on the bet you place. Without any further ado, let’s get down to business and make you a proficient craps player. The following bets are the safest moves you can make in a game of craps. The reason is the fact that these wagers imply the lowest house edge you can hope for. The concept of these bets is simple to grasp. In combination with good odds they provide, they are the perfect strategies, especially for beginners. Along with the come bet, the pass bar one is commonly referred to as the right way of betting. That does not make the other ways wrong (well, at least not all of them). The phrase originated from the fact that the players who place their wagers on one of these areas are betting on the shooter’s side. The pass bet is truly the right way to go. You can lose only if the shooter rolls craps (2, 3, or 12), or in case they seven out before hitting the point they have established. The come bet is similar to the pass one, except for the fact that it is not available until the point number is rolled. Once it is, you can lay a wager on that section of the table and wait for the natural winner to bring you winnings, if you manage to dodge the craps. However, if any other number turns up, you have made your own point. As opposed to their counterparts, these wagers make you a wrong way bettor if you place them. The concept resembles the one I formerly described. The key difference is that you are betting against the shooter if you choose the wrong way. Therefore, if you are a wrong way bettor at the beginning of the game, the natural winner will not be your ally, but the craps will. However, if the shooter happens to seven out, you and your opponents will all be in the same boat. The don’t come bet works in a similar way. However, it can be placed after the point has been established, which is the aspect in which it resembles the come bet. If the dice show a 2 or a 3, you win. If a 12 turns up, you tie. A 7 throws you off track if it appears before a number that has become your point. There is a trick you can use to bring the house edge way down — to zero, to be exact. However, this move must be combined with some other ones — so the truth is that the house edge still exists, but is rather low. Placing the odds bet can really come in handy and result in a profitable game. You can place it on top of your right and wrong way bets with slight differences. Placing it on top of the pass or come bet is called taking the odds. You do it if you expect the shooter to hit their point before rolling a 7. On the opposite end of the spectrum, there is a possibility for laying the odds. If you have placed a don’t pass, or a don’t come bet, you can lay the odds in case you hope for a seven rather than a point number. The amount of the odds bets is usually three or four times bigger in comparison to the amount of your original bet. The odds bet can prove to be a rather lucrative move, so I advise you to make it whenever you have a chance. Given that you are probably already familiar with the look of the layout, I assume you know what the field is, and that you comprehend its purpose. The field bet is a great solution for all the players who want to place a proposition bet with better odds of winning. The house edge for this wager is around 5%, which is significantly lower in comparison to other one-roll bets. You do not even have to remember the number you are betting on. All of them are written in the appropriate section of the table. Nevertheless, not all outcomes bring equal payouts. I advise you to bet on a 2 or a 12, as they pay 2:1 or even 3:1 at some casinos. When you gamble at a casino, keep in mind that the house is your opponent. It is not in any casino’s interest to deliver huge payouts to you. To put it simply, they do not want you to win because they lose when you make a profit. Therefore, it should not come as a surprise for you to hear good things about moves that are seldom made in craps. You are likely to be told that some bets can end up bringing huge payouts, provided they are won. However, you are unlikely to hear the downside of such bets, and that is their house edge — it is high just as the potential winnings. You actually have very low odds when it comes to making such moves, as they involve taking big risks. I advise you not to rely on the following strategies unless you are extravagantly wealthy. Otherwise, you may end up leaving a casino empty-handed. If your motto in life is “go big or go home,” and you are tempted to place your chips on these areas, you may actually end up going home. Laying a wager on the big 6 or big 8 is among the worst moves you could possibly make. The house edge is over 9%, which would logically lead to a conclusion that a huge payout is waiting at the end of the tunnel. However, this bet pays out only 1:1. Why would you waste your time and money? Nevertheless, do not mix this strategy with betting on a 6 or an 8. These bets are not the moves I would advise you to make either. However, they are a far better choice than the previous ones, as the house edge is significantly lower (about 1.5%). You are familiar with an option of placing a bet on an even number and counting only on one outcome to bring you winnings, aren’t you? Let me clarify this — I am talking about hard numbers (2, 4, 6, 8, or 10). Basically, if you choose to bet on the hard 8, you can win only provided the dice land on two fours. If, for instance, the dice show a 5 and a 3, that is an 8, but not a hard one. This means you lose. Why would you limit yourself to only one option? The snake eyes are rare, and the house edge this type of betting implies is around 10%. One-roll bet entails trusting only one roll of the dice with your money. Who in their right mind would take such a huge risk if they hope to win? You can never know how the dice will roll, and you need a lot of luck to manage to guess the outcome of the next roll. The payouts these bets can provide are really high, but restrain your greediness. As the payout ratio grows, the house edge grows exponentially. I would not recommend placing one roll bets, especially the ones with only one favorable outcome. Along with the already mentioned player-friendly moves, the 5-count method is something you ought to familiarize yourself with if your goal is to play safe. This strategy provides good odds, but is not for the players who cannot gamble without the rush of adrenaline. This strategy is based on counting the shooter’s rolls. There are five levels, so bear with me. Count zero is the come-out roll. If the shooter manages to establish a point, you take the count to the next level. Once the point is established, each roll represents a step towards your goal. Each is worth one point, regardless of the outcome. When you reach count 4, the shooter has to hit their point so that you can go up to the highest level. Once you get there, you have 5 points, and it is time for you to place your bets, sticking to the ones I have listed as smart moves to make. Now that you can tell the difference between a good strategy and a bad one, you can practice by playing online. When the time comes for you to place the chips on the table and hope for them to turn into bricks at the end of the evening, do some basic mathematical calculations to see which numbers have the highest chance of appearing.